Henry VIII hopes for love, marriage and ultimately a son in a golden carriage with Anne Boleyn. No matter what the cost. Richard Burton, Keith Michell, Robert Shaw, Charlton Heston, Eric Bana, Damian Lewis and Sid James. All these differently remembered actors with a joint claim to fame of playing one of England’s most notorious Kings, King Henry VIII. An English Tudor King who is also remembered for his turbulent love life with him being husband to six different women. Who as the poem goes… divorced, married, died, divorced, married, survived. Anne of the Thousand Days (1969) is about the rise and fall of Henry’s second wife, Anne Boleyn. It’s one of the best of Burton’s performances. With his regal role combined with my favourite period in English history, it was kind of inevitable that this film, herald the start of the Richard Burton blogathon. This film nominated for a massive ten Oscars including one for Burton and one for the actress playing Anne Boleyn, Genevieve Bujold. But bringing back just the one from the 1970 Oscar Ceremony . In this film adaptation of true events, Anne Boleyn (Bujold), Thomas Boleyn’s (Michael Hordern) youngest daughter returns from the French court. Anne is engaged to Henry Percy, in love and hoping this love match approved by the King, Henry VIII (Burton). However the King is unhappily married to Katharine of Aragon (Irene Papas) with a young daughter, Mary. Henry is discouraged as without an heir, as he sees a son as fitting his crown better than a daughter. Seeing Anne he falls in love, and feels he must have her. With Cardinal Wolsey (Anthony Quayle) doing Henry’s bidding he denies Anne’s hopes for marriage with Percy. And Wolsey making an enemy in Anne. She turns down Henry’s offer of her being his mistress. With her pregnant sister Mary in this role until he met Anne. Mary now dismissed from this duty, which brought titles and fortune to her family. In time, Henry woos Anne and asks Anne to be his Queen, but he must seek a divorce through the Pope. Breaking away from the church, and plundering the monasteries gives Henry new powers and wealth. However after three years of marriage, with a daughter to Anne and then a still-born son, Henry seeks evidence to end his marriage with Anne. This film with its English castles including Hever Castle (where the real Anne Boleyn was brought up), those magnificent costumes and meticulously detailed sets and the Tudor inspired music adding up to sumptuous lavish period piece. It all makes you feel you’ve returned back in time to this Tudor King’s court. Combined with the presence of some great actors including Anthony Quayle, Michael Hordern and John Colicos and actresses including Burton’s then wife, Elizabeth Taylor in a wee cameo make it a lavish affair. And one to be treasured. Richard Burton, as Henry VIII has the gravitas, charisma and presence for this regal role. Much, much more so than others who played him. Here Burton giving an emotionally charged performance. Showing not just the king in a regal sense, but here showing his complex character as the man behind the crown. Burton rightly receiving his sixth out of his seven Oscar nominations (but surprisingly never winning) for this portrayal. A role which arguably he is at his blustering best. Be it his initial jovial, upbeat scenes with his noblemen in how to get this girl. His scenes with this girl with Bujold’s Boleyn, mesmorisingly acted with Burton conveying Henry’s vulnerabilities seen in full force. Be it him feeling lust, love, hurt and pain all exhibited so emphatically and credibly. You can feel this man’s torment as he falls for Anne and then you feel his anguish again in such a short time when he finds he must condemn her. This as he signs her death warrant. His first scenes with Bujold showing him fall for her when unhappily married to Katharine of Aragon. Henry becoming obsessed with having Anne Boleyn whatever the cost to others even if it means hurting her, the church and his noblemen. Hurting Anne by denying her proposed love-match and engagement to Henry Percy. This so he can have her, you understand this King’s torment when he cant have her almost behaving like a spoilt child. This conveyed so well in those eloquently acted scenes with Burton’s eyes, voice and facial expressions showing this so credibly. As Anne Boleyn holds out against him, almost to hatred point when she hears of this denied engagement and her new role to do her daughterly duty for her family. This particularly understandable with her sister,Mary, the King’s former mistress and pregnant to the King. With Mary callously discarded in Anne’s favour. In his scenes with Irene Papas’ Catherine of Aragon, Burton is cold and unfeeling in comparison to these initial scenes with others. And these chillingly recreated as Anne loses favour, after her child born as a still-born boy. With that familiar lust, and desire seen once more now aimed towards her Lady in Waiting, Jane Seymour. Once Anne promised the Crown, and she becomes his, Henry seems content, loving and hopeful for an heir. With his scenes breaking up this marriage to Katharine, Henry appears his most unfeeling, not caring for the repercussions for the church, the Vatican and the threat from Spain. Burton’s part in the script conveyed in the way it should. With more of the man behind a crown as he wrestles with his conscience constantly in his strong beliefs that Anne will give him the son. Yet Burton helps you comprehend his inner pain when Elizabeth born, with his performance to wife and daughter masking his disappointment. These in contrast to her later scene, where you witness his cold-hearted manner where Anne delivers a still-born boy. And you immediately feel for Anne, with her and you understanding this her last chance to prove herself as a suitable wife to him. Bujold as Anne Boleyn also giving her all and in this Bujold’s first English-speaking role she excels. She makes Anne, a willful strong character towards Henry from the start. Anne in time relishing her power as she becomes the King’s muse then Queen in getting her revenge on Wolsey, the King’s Cardinal. Blaming him for his breaking up of her engagement with her true love. And Percy’s marriage to someone else soon after their break up. However through Bujold’s performance you feel how precarious Anne’s position. Her situation, with the King’s affections towards her, and an ambitious family. You understand through Bujold’s strong performance how Anne realises that she can only succeed where her sister failed with the promise of being his Queen, and their descendants heirs and heiresses to the Crown. Her scenes at the birth of her children showing her disappointment and fear are easily felt in a vulnerable performance from Bujold. Anne’s pride as a mother to Elizabeth shown, as she fiercely protects her daughter’s best interests are seen til Anne dies at the scaffold. Richard Burton, Keith Michell, Robert Shaw, Charlton Heston, Eric Bana, Damian Lewis and Sid James. These actors appear to have only their role as Henry Viii in common. With the bawdy British comic actor, Sid James parodying two of Burton’s roles in Carry on Henry and Carry on Cleo in this film and in this film and Cleopatra respectively. In both of these films, these actors even sharing the same historical wardrobe which won best Costume Design at the Oscars. And both Burton and Heston had a joint on-screen romance with Bujold. However in Earthquake (1974), Bujold lost her lover -played by Heston – who returned to his wife. But to me she’ll always remembered here in this role where, wife number two, Anne Boleyn. One of a couple queens who lost their head to Henry VIII. This film review was added to my Richard Burton blogathon. Other reviews with the cast include Anthony Quayle in The Eagle Has Landed and Murder by Decree. Michael Hordern in Yellowbeard and The Slipper and The Rose. Genevieve Bujold in Murder by Decree and Earthquake. John Colicos starred in The Postman Always Rings Twice. Great review only watched this recently for the first time and thought it was excellent. I loved Richard Burton’s portrayal of Henry VIII showing his passion/obsession for Anne and his disdain for Catherine. He is fantastic in this film, definitely one of my favourite roles. I AM DYING TO SEE THIS ONE- my Aunt has been wanting me to watch it for years but I can’t find it- a searching on streaming I will go!!! Jonathan Rhys Meyers is my definitive and favorite Henry VIII but I can make room for R.B!! He is too cool not be be good in this role! I only wish I’d remembered about it for your Royal blogathon years ago, its a classic one. Burton is lovely. Beautifully done essay! I too love this film very much, and rank it among both Burton and Bujold’s best performances. It’s also tops for me among historical dramas like Becket (with Burton!) and Man for All Seasons, just below the amazing Lion in Winter. Need to pull out my dvd of this and watch again. 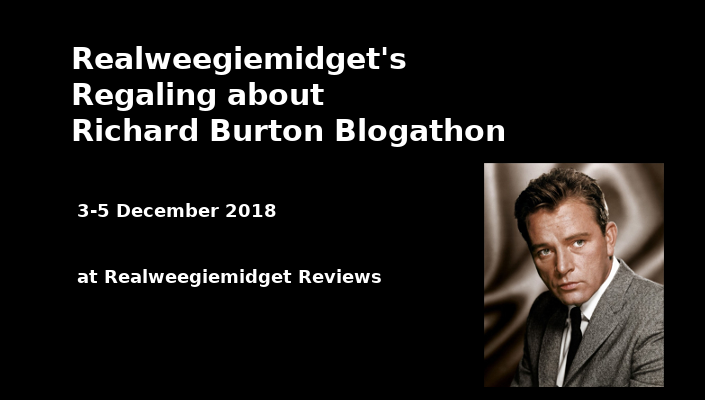 So looking forward to exploring your marvelous Burton Blogathon! Thanks Chris – always value your comments and yet another film we both adore! Very interesting review. My mom and dad both love this adaptation. I haven’t seen it, but I can definitely imagine Burton being wonderful in the role. Do check this film out, even if its just the trailer – Burton gives a powerful performance. Anne of a Thousand Days truly is an impeccably produced and acted historical drama. Time only adds to its lustre. PS: My first thought when it comes to actors portraying Henry VIII always goes to Charles Laughton. They gave him an Oscar. Burton just seemed to have bad timing when it came to the award. Not seen this one, was a wee bit obsessed with Henry VIII and his 6 wives as a kid, but have avoided the Tudors – but did love the Other Boleyn Girl with Natalie Portman and Scarlett Johansson. And the Keith Michell one from way back then..